The Refugee issue is a burning topic in Greece, but as well in Germany. Therefore it was a constant topic during the whole forum. 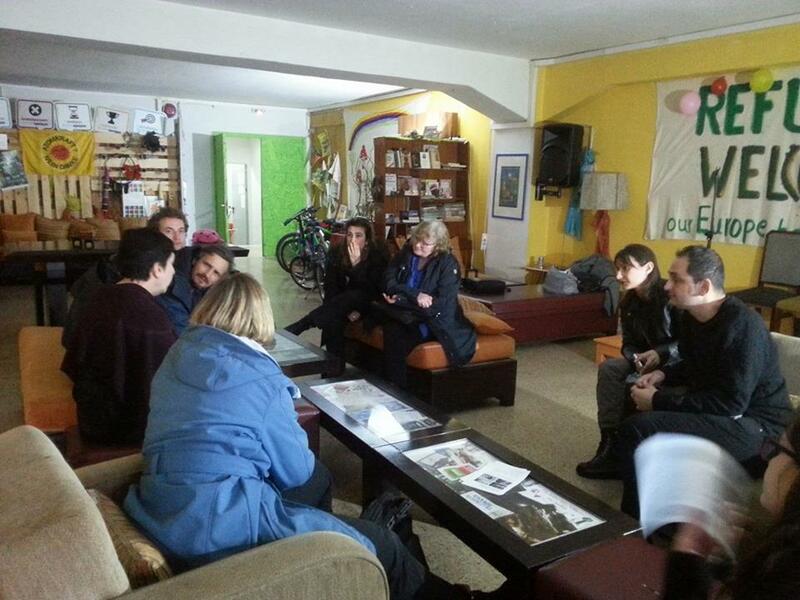 In workshops, field visits and talks Greeks and Germans exchanged insights about the countries realities. Starting their journey in Frankfurt, Patras, Munich or Athens, the participants arrived in Thessaloniki with a lot of expectations on the 2nd Greek-German Youth Forum. Filled with dreams and ideas for a new era in both, the two countries and the cooperation in the youth sector. With the hope for a positive change. For a generation that is experiencing some very tough challenges, international collaboration tends to be one of the most decisive tools allowing people to find much needed solutions to the problems they face. The success of their objectives was based largely on the analysis and understanding of critical issues for both countries as the refugee issue is one. The Mostar Friedensprojekt e.V. is a registered NGO with commitments in the state of Brandenburg in Germany. There socio-cultural activities, artistic and cultural events and cultural publications at the local, regional and national level are organized since 1994. Information, general support, humanitarin aid, job qualifications and consultancy to refugees and asylum seekers are provided. The organisation has many partners in the Western Balkan countries, east Europe and the Caucasus, tells Eggert Hardten from the organisation. He held the workshop on supporting structures for refugees together with Ioanna Petritsi from ARSIS, the Association for the Social Support of Youth in Greece. ARSIS is a 1992 established NGO specialized in the social support of youth that are in difficulty, danger and in the advocacy of their rights. To prevent youth marginalisation, the elaboration of policies which defend youth rights and the active social support of disadvantaged youngsters are the organisations’ targets. ARSIS operates in Athens, Thessaloniki, Volos, Karditsa, Polygyros and Tirana. Common ground of the two organisations was the importance of the education process, the smooth integration of refugees in society and the development of skills and competences. In the workshop the participants found out, that in Greece the relevant procedures are very slow, although most of them have been launched as the existence of the so-called „safe areas“ is not considered sufficient, Petritsi said. In correspondence the German reality has to adapt to the growing number of refugees, but also to the various public reactions. All of those issues are further incentives for both countries in order to cooperate even more. By using group games and brainstorming techniques Alexios Georgalis from the Hellenic Scout Association showed the importance of terminology: “Terms often define policies, but they also defines lives”, he said to sensitize the participants. In this way of thinking intercultural dialogue has to be a basic principle of building relationships. “A man who wants to help doesn’t need to care about what title a person has, when someone is in need of help”, he stressed. By doing a field trip, the participants of the Forum had the chance to visit the NGO Oikopolis and Naomi in Thessaloniki, which is doing great for refugees to support them with activities, to integrate them into society as active citizens. One approach is to use interactive art learning seminars in order to ensure a first income for them. In the food preparation process and to create a safe and comfortable space for the children and everybody has become a concern of everybody who lives there. Im Rahmen der Projektbesuche der Teilnehmenden des zweiten Deutsch-Griechischen Jugendforums besichtigte eine Gruppe die Organisationen Oikopolis und Naomi, die in der Geflüchtetenhilfe Thessalonikis aktiv sind. Verantwortliche von Oikopolis berichteten von ihrer Arbeit für Bedürftige. Als eine in der Umweltbewegung der 1980er Jahre gegründete, sozial-ökologische Organisation stehen bei ihr Themen der Nachhaltigkeit im Zentrum. Diese Haltung zeigt sich überzeugend in einem Fahrradverleih und Fahrradunterricht, sowie bei gemeinsamen veganen Kochaktionen. Ursprünglich ein Projekt der Evangelischen Gemeinde Deutscher Sprache Thessaloniki engagiert sich nun Naomi selbstständig für Geflüchtete und ihre Integration. Neben dem Angebot von Deutschunterricht für Personen mit berechtigter Hoffnung auf eine Familienzusammenführung, scheint das Projekt der Textilwerkstatt das Herzstück von Naomi zu sein. Die Projektverantwortliche Elke Wollschläger und ihre Unterstützer*innen führten engagiert durch die Räumlichkeiten: An mehreren Nähmaschinen ermöglichen sie Geflüchteten einer geregelten und produktiven Arbeit nachzugehen. Von Nähkursen für Neulinge bis zu ambitionierten Designentwürfen und Umsetzungen ist für alle Interessierte was dabei. Der Clou: Aus den Decken, die nach der Räumung des Flüchtlingscamps von Idomeni zurückblieben, werden hier Winterjacken genäht. Die sehenswerten Resultate werden gegen Spende, die zu 100% an die Näher*innen gehen, verkauft oder an Bedürftige verschenkt.